Rose Picicco has won the fifth annual Wandsworth Young Chef of the Year competition. Rose, who attends Southfields Academy, wowed judges at last night’s final with her dish of cod cakes followed by chicken parma ham, with a Portuguese desert of natas de ceu. The Young Chef competition is run by the Mayor of Wandsworth and the council’s lifelong learning team in association with borough schools. It nurtures young talent, teaches young people how to cook good healthy food to a budget, provides a chance to learn from the experts and helps young people get a foothold in the catering industry. Each of the eight finalists won high street vouchers, with Rose scooping the top prize of £130 and a crystal trophy. The other finalists were: Zakareya Ahmad ( Ernest Bevin), May Newkey-Burden (Burntwood School), Yafiet Binyam (Ernest Bevin College), Raheela Aslam (Ark Putney Academy), Farnaz Abubaka (Ark Putney Academy), Jamiee Hyacinth (Chestnut Grove) and Jada Burrell-Powell (St Cecilia’s). Young Chef is funded in part by the European Social Fund/Education and Skills Funding Agency Careers Cluster project Pan Out. Pan Out has enabled this and other initiatives that have developed and supported students in Wandsworth. For more information visit www.panout.london. Support for the competition was provided by the South Thames College catering school and major catering company Compass Group UK & Ireland, which has been involved with the competition since it launched in 2013. Chefs from Compass Group UK & Ireland judged the final, overseen by Culinary Director at Compass Group UK & Ireland, Nick Vadis. 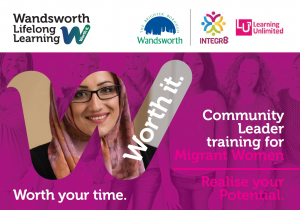 Contact the Lifelong Learning Team via their website at www.wandsworthlifelonglearning.org.uk or call them on (020) 8871 8618. If you are interested in attending the Mayor’s charity dinner, call (020) 8871 6604.